TidalWave Comics applauded for illustrated biographies featuring the famous and infamous who influence our politics, entertainment, and social justice, is proud to present its newest comic book release this week. Telling the life story of a world-renowned physicist, cosmologist, and author Stephen Hawking, “Tribute: Stephen Hawking,” is written by Michael Lent, Brian McCarthy and Michael Frizell with art by Zach Bassett. The comic book features a cover by famed artist Robert Aragon. “Tribute: Stephen Hawking” is out this week in print and digital. With the passing of English cosmologist, theoretical physicist, and author, the world has lost one of the greatest scientific minds of the 20th and 21st Centuries. Hawking united the general theory of relativity with quantum mechanics but may be more known for his rare, early-onset and slow-progressing battle with Lou Gehrig’s disease. Hawking believed in the concept of an infinite multiverse. Perhaps he’s watching us mourn his loss. Stephen Hawking is one of the most brilliant minds of this century. The comic explores his brilliance while revealing some surprises. Hawking’s life has been the subject of several movies, including the 2014 hit, “The Theory of Everything” starring Eddy Redmayne, who received an Oscar and a Golden Globe for his performance as the scientist dealing with an early-onset slow-progressing form of Lou Gehrig’s disease. 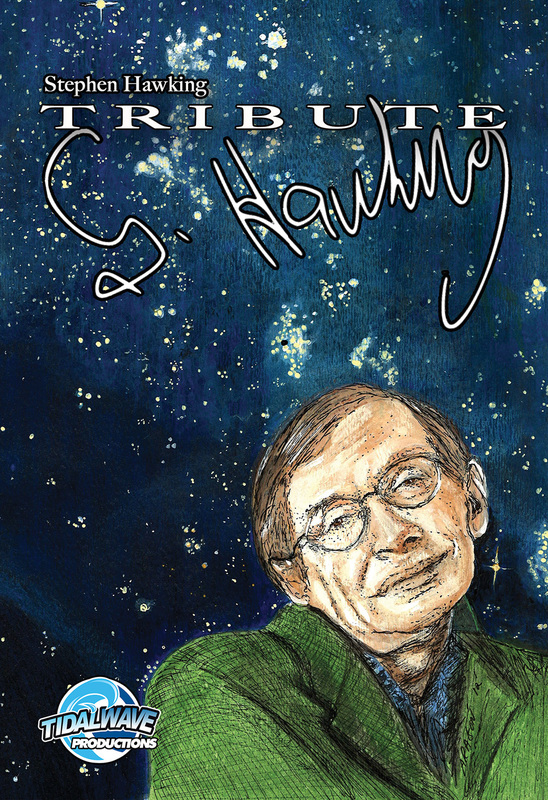 The comic seeks to add to Hawking’s story. “I learned a lot from reading the script and doing the research for the issue. The very concept of making an engaging comic book where the protagonist is essentially immobile is a pretty tall order, but I think the key to us keeping it exciting was being able to get inside his mind (one of the greatest of our time) and show some of his most abstract concepts in a visual and dynamic way,” said artist Bassett. Darren G. Davis, publisher and creative force behind TidalWave, believes as Bassett does that the visual storytelling model is a good way to tell the stories of real people. “I was a reluctant reader when I was a kid. The colorful pages and interesting narrative I found in comic books drew me in and made me want to read.” In a market crowded with superheroes, the publisher’s work is embraced by major media outlets, libraries, and schools. Michael Frizell, one of TidalWave’s writers and the author of the Bettie Page comic, enjoys writing for TidalWave’s biography lines Political Power, Orbit, Female Force, Tribute, and Fame because of the publisher’s approach to the books. “Darren asks us to focus on the positive and to dig deep to explore the things that make the subject tick – the things that drive them,” Frizell said. In print on Amazon and are available on your e-reader from iTunes, Kindle, Nook, ComiXology, DriveThru Comics, Google Play, Overdrive, IVerse, Biblioboard, Madefire, Axis360, Blio, Entitle, EPIC!, Trajectory, SpinWhiz, Smash Words, Kobo and wherever eBooks are sold. TidalWave’s recent partnership with Ingram allows them to produce high-quality books on demand – a boon for the independent publisher. The comic book will feature a heavy-stock cover and bright, clean colors in the interior. Ingram works across the full publishing spectrum, aiding some of the largest names in the business to local indie authors. Comic book and bookstores can order these titles in print at INGRAM. TidalWave’s biography comic book series has been embraced by the media and featured on television news outlets including The Today Show and on CNN. The series has also been featured in many publications such as The Los Angeles Times, MTV, Time Magazine, and People Magazine.